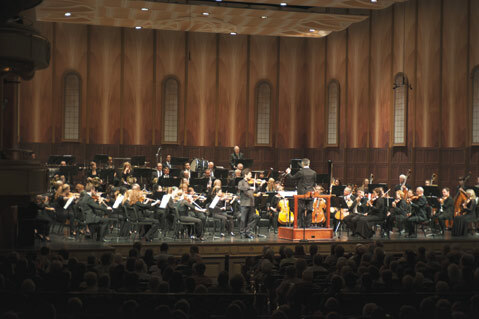 The Santa Barbara Symphony with Philippe Quint, violin. At the Granada Theatre, Saturday, April 11.
his excellent concert showed the Santa Barbara Symphony at its best not only musically but also as a civic institution capable of responding to and acknowledging its audience. Before the music began, Sara Miller McCune made a rare appearance onstage alongside Maestro Nir Kabaretti to dedicate the program to her close friend, the late Léni Fé Bland. “I met Léni at the Santa Barbara Symphony,” said McCune, leaving the many friends and admirers of Fé Bland and the Symphony in the audience to consider the depth of feeling conveyed by McCune’s observation. McCune went on to describe Fé Bland’s impact on Santa Barbara as a “gift from the Old World to the New World,” calling attention to one aspect of the program that was devoted to works written by composers who emigrated to the United States. The opening piece, Guardian Angel by Karen Tanaka, appealed to another side of the dedication, which was the sense that the spirits of our better angels — those whose generosity and sense of purpose were prominent while they were alive — linger long after they are gone. Guardian Angel is a gentle piece, but it is suffused with harmonic energy emanating from the impressionistic overlapping of chords, an effect that Maestro Kabaretti described as the sound of angels ascending. The Violin Concerto in D Major, Op. 35 of Erich Korngold, filled with dramatic themes and instrumental fireworks, presented a marked contrast. This concerto requires a balancing act on the part of the soloist. Fortunately, Philippe Quint, who is also an immigrant — he moved to the United States from Russia — has his feet firmly planted and was thus able to juggle the Mahlerian orchestral passages with the multiple themes Korngold redeploys from his work as a composer of Hollywood film scores. The opening movement, Moderato nobile, immediately put the soloist on the spot, and from there he won over the room with the warmth of his tone and his brilliant technique. Korngold ranks with Bernard Herrmann and Elmer Bernstein in the pantheon of great film composers. Antonín Dvořák’s Symphony No. 9 in E Minor, Op. 95, “From the New World” allegedly involves considerable influence from both African-American spirituals and Native-American music. The transformation effected on this material by the Czech composer may have eliminated most of the identifying traits of these idioms, but that in no way diminishes his achievement. “From the New World” remains one of the most instantly identifiable and compelling symphonies in the repertoire, and the Santa Barbara Symphony did a splendid job of revealing its majestic depths and heights. Concertmaster Jessica Guideri gave a memorable account of the piece’s short violin solo, and the orchestra’s brass and winds were powerfully effective throughout. The great heroic final theme resounded through the Granada as a reminder of what orchestral music can do to bring a community together. As a tribute to one of Santa Barbara’s most beloved patrons of the arts, it was entirely appropriate.